Yay, it’s time to make one of the FUN parts of the costume! and today we’ll be adding the mane to the center seam of our hood. First, make a small mark along the top of the hood showing where you would like you mane to begin. 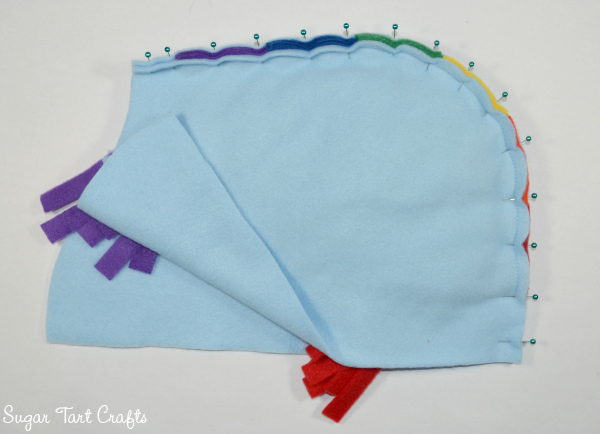 The pattern I am sharing has a 1.5 inch base so I suggest beginning the mane roughly 2″ past your stitch line. 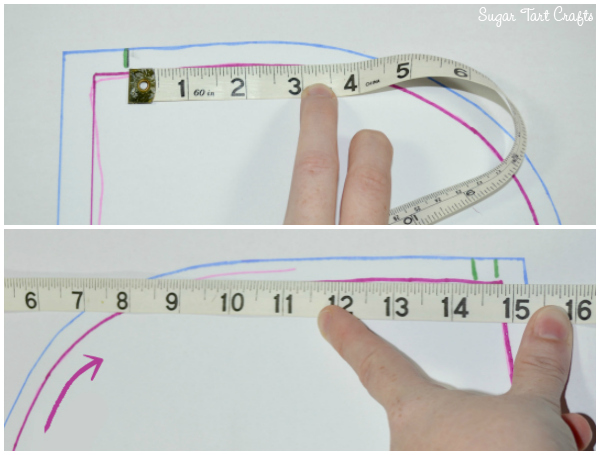 Use your measuring tape to determine the distance from your new mark around the curve to the stitch line at the lower back of the hood. It doesn’t need to be an exact measurement, but you should have a rough idea of the length from the front to the back of your mane. 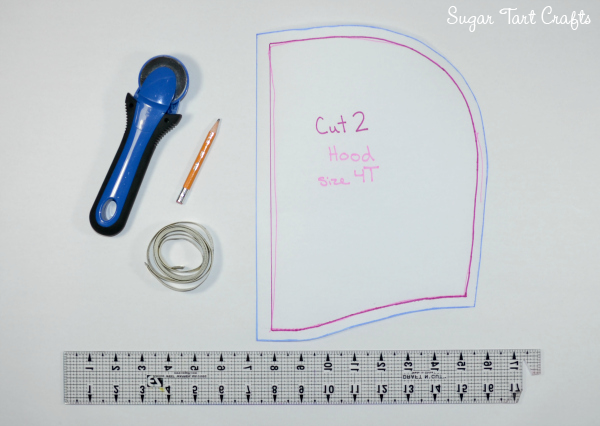 You’ll need to cut a rectangle the length of your hood measurement by the length that you’d like the hair of your mane to be. 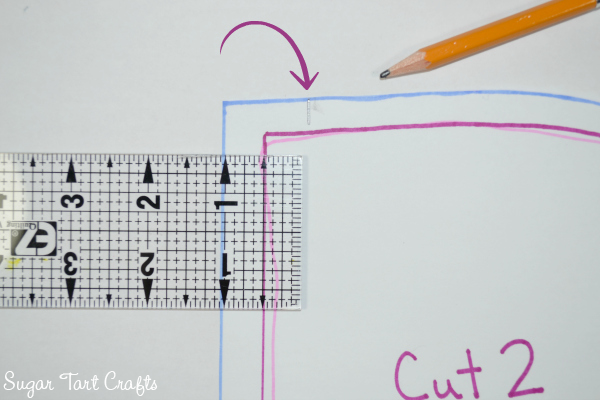 Once you have decided on the size of your rectangle you’ll need to begin cutting it into strips to form a fringe. 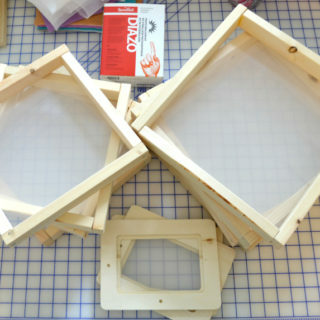 Again, the strips could be any width, but I’ve found that I personally prefer 5/8″. Continue across the rectangle until you reach the end, and discard any small leftover bit that doesn’t divide evenly by your measurement. Just be sure not to cut entirely through the rectangle. The strips should still be attached along one edge. 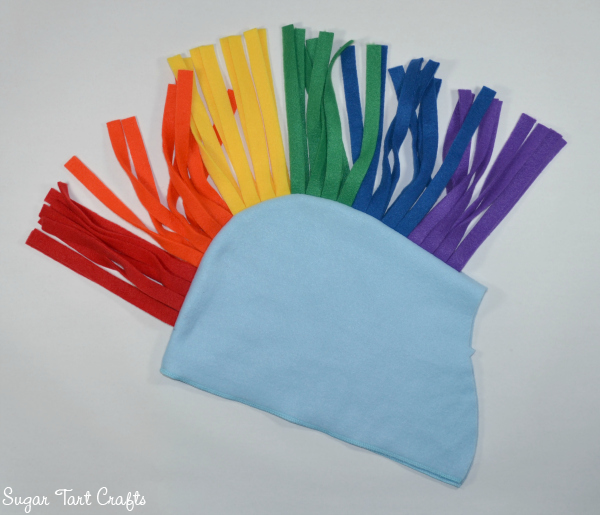 If you are sewing a multi-colored mane like Rainbow Dash’s, you’ll need to divide your hood measurement by the appropriate number of colors and piece them together accordingly. 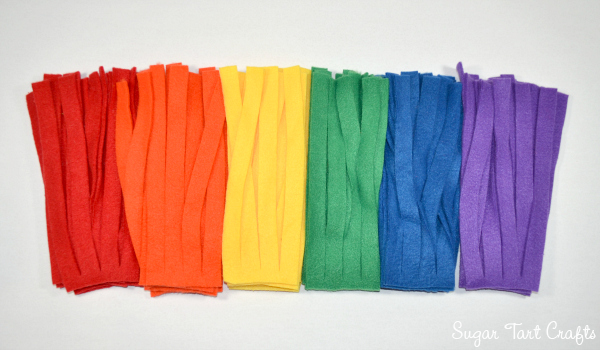 For Rainbow Dash I have found that four 5/8″ strips of each color (for a total of 24 strips) works well for most toddler sized hoodies. 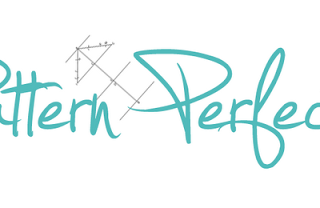 Remember, you do not need to meet the full hood measurement (15″). It is simply a guideline. Once all of your strips have been cut, transfer the original markings to your hood, and begin to pin the mane in place. …and this is one of my Twilight Sparkle versions. 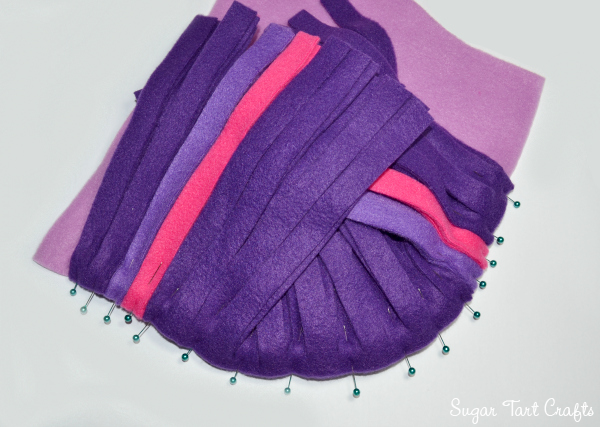 Pin a row of fringe along each side of the hood, and then baste the pieces in place. and stitch through all four layers along the curved edge of the hood. or second row of straight stitches to help reinforce the seam. And this is what you should have when you turn the hood right side out! Isn’t it lovely? We’ll stop there for today, and pick back up tomorrow with the zipper and the rest of the hoodie. Thanks! Love it – making the twilight sparkle version. 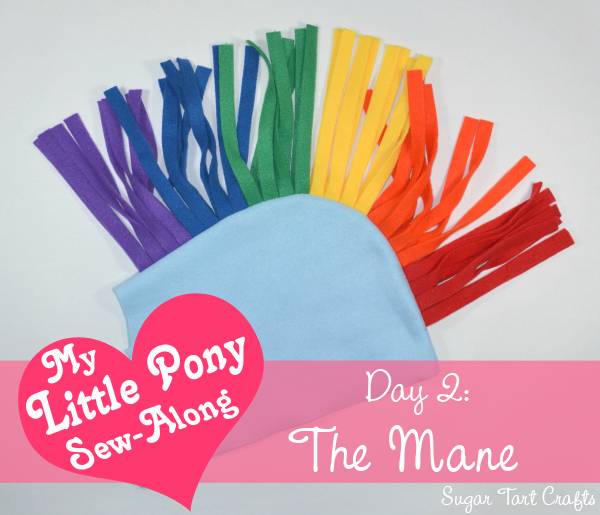 Are each of the mane strip 5/8" for a total of 2 1/2" segments? I am making Rarity for my 6 year old and Rainbow Dash for my 3 year old. They saw the costume and I wasn't sure how hard it would be. I looked at the first 3 tutorials and decided you made it totally do-able! 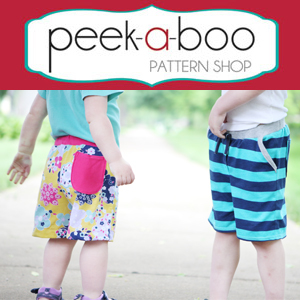 I just drafted my pattern today and hope to start sewing tomorrow! 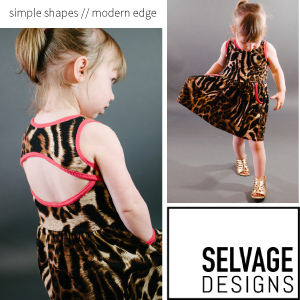 Thanks for the great sew along! I finally got all the rainbow mane cut out and pinned together and the rest of the jacket ready to sew. Except, I can't get the blasted sewing machine to keep a stitch in the fleece. It's like ghost sewing. Sew all you like there'll be nothing there. I switched to a scrap of a different colour, other than blue and it's easy peasy. I switched back to the blue. No go. I'm going to bed. I don't know if it's my 1960's vintage sewing machine or if I'm doing something wrong but I'll certainly think more clearly in the morning. If I have to I don't mind hand sewing the mane or ears but … grrr… Walk away from the sewing machine and sleep on it. Oh gosh Julie, I'm so glad you went to bed before it got any worse. I'm absolutely terrible ant "just walk away" and have definitely ruined my fair share of projects while sewing when I'm tired. If it's still giving you trouble today I suggest: 1- Completely re-thread your machine. Sometimes that works magic. 2- change your needle. 3- run a test scrap that is folded in half. 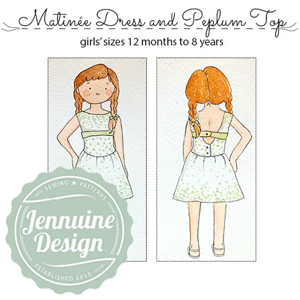 It sounds like your needle isn't catching the bobbin thread on the bottom. Your machine might be having trouble with the double thickness of the fleece. Hopefully that's not the case though, and a simple re-thread will fix it! Thank you, thank you, thank you!!! I changed the needle and it sewed fine. That's great! Glad it was something so simple! Did you just "brush" some of the mane forward to be bangs on Twilight? Or did you install that separately? You are amazing! Thank you SO much for sharing this with everyone! I am going to make twilight sparkle for my daughter. I was wondering How and When you attached her bangs in the front of the hoodie. Thanks Bonnie! The bangs were a last minute addition on mine, but i did it in a way that the stitches were hidden in an existing seam. You can easily finish this part of the mane, and then attach those later if you'd like. Just remember to leave a gap for the horn. 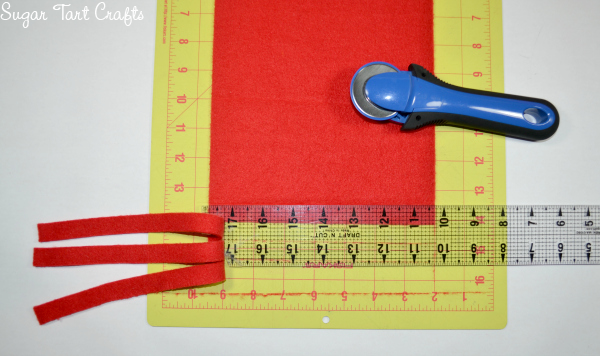 You can make the horn ahead of time, but don't stitch it in place until after the bangs are on. i also realized that there were no instructions for the bangs, but found a quick and easy solution – simply make a lined hood! 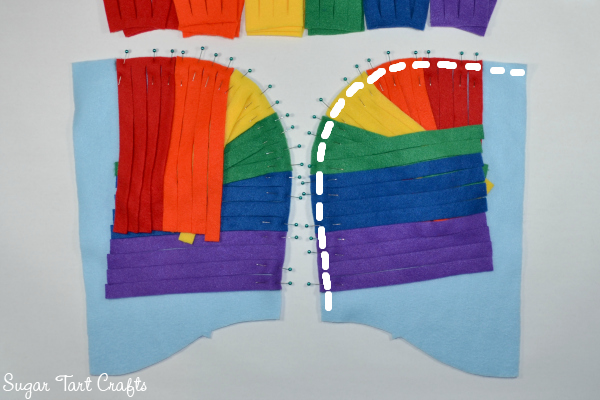 when you pin the inside and outside of the hood together, add in a shorter version of the mane fringe right along the centre line between the two layers. 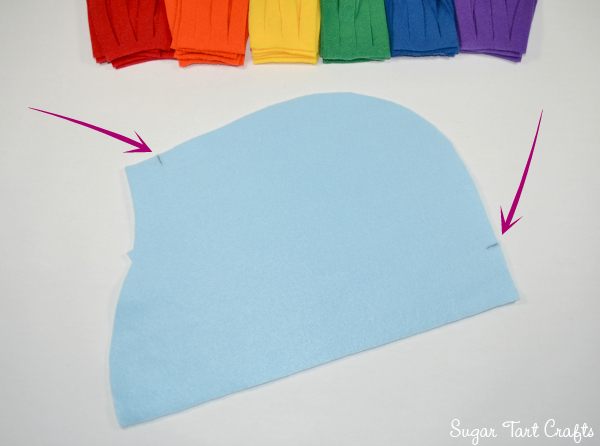 sew a 1/4" seam and when you invert the lined hood you'll a gorgeous set of bangs with all seams still neatly hidden! 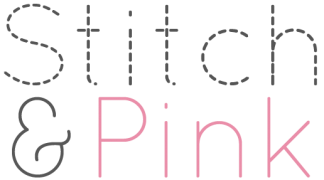 Hi Toni, love your site here, you are an amazing seamstress. My daughter wants to be Apple Jack. I'd love to hear any suggestions you might have for her bangs. I was thinking of just doing them to one side and varying lengths maybe. Thanks so much! 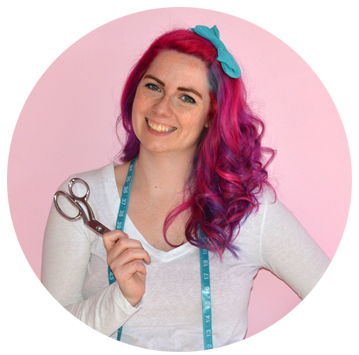 I've been trying to squeeze in one last tutorial about how to do the 2 different style of bangs (Twilight and Rainbow/Applejack), but I've just been extremely swamped. I'm working on 2 more Twilight hoodies today, and a Rainbow this weekend though, so hopefully I'll be able to get the pictures I need in time for a Monday tutorial. If you need dirrections earlier than that, just send me an e-mail and I'll try to muddle through a written explanation. That's a brilliant idea to make the hood separately! 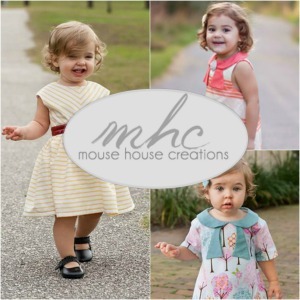 (especially great for anyone living in a warmer climate) Looks like you're on you way to an awesome dress-up set! We live in Canada, I tried to decide if I was going to make her something large enough to go over a snowsuit (if it snows or gets that cold on Halloween) or be worn indoors and then to figure out something else to wear when outdoors. I think the hood was the best solution I came up with not to mention am not very good at sewing and wanted to avoid a zipper at all costs 😉 . I finished the tail belt today with hand sewing on three iron on apples that we had found at the fabric store. My daughter has a costume party tomorrow so she will get some use out of it. Monday should be fine. I can work on the other things I still need to do before then. If you google "Twin Dragonfly Designs – Scrappy Unicorn Costume" you'll find a good tutorial for working with a pre-existing hoodie. 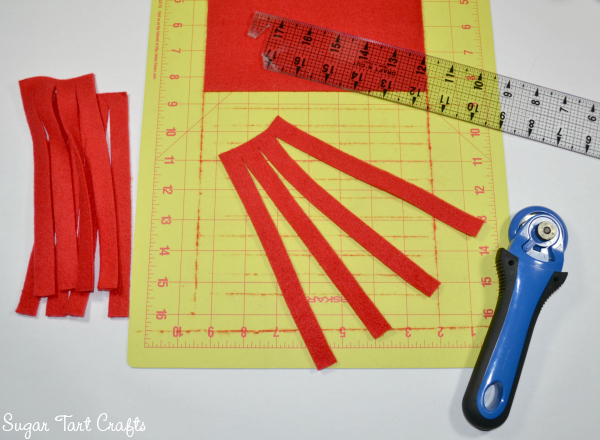 I'm pretty bad at following directions w/o any pictures, but if you are saying…Cut a long strip about 6" wide, make fringe on either side of that strip, and then stitch down the center…then yes, that would work as well. I might use 2 layers of fringe though just to make it a little fuller. Hope that makes sense! That's exactly what I was saying. 🙂 Thanks for the google referral, her site is pretty interesting and I like the idea of reusing our white hoodie (though I honestly think my daughter would ADORE wearing it fully ponied up 😉 ). I can’t for the life of me figure out where this applies. 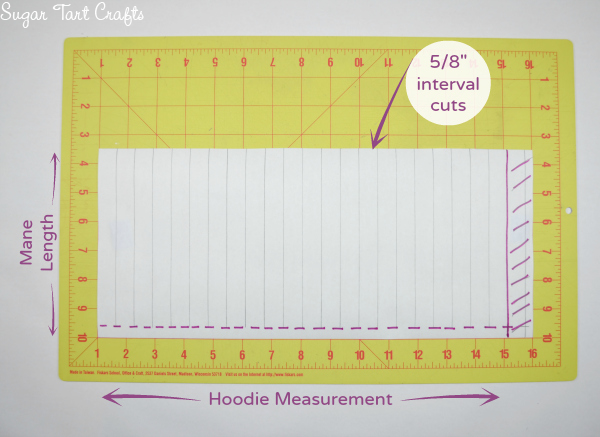 Is it 2″ past the stitch line at the base of the hoodie, where it will eventually attach to the neckline? By 1.5″ base, do you mean stitch allowance on the bottom of the hoodie? I hope you can shed some light for me! Hi Jill! The 1.5 inch base is refering to the bottom of the horn. If you are making a unicorn character, you’ll need to start the beginning edge of your mane about 2 inches back from the front edge of the hood in order to leave space to attach the horn later. 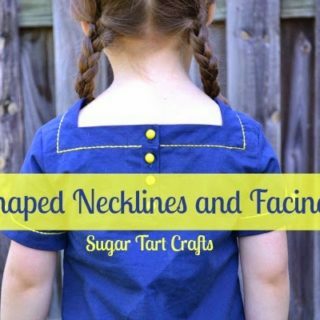 If you’re making a regular pony, you can skip that step and begin your mane about 1/2″ from the front. Hope that helps – Good Luck!